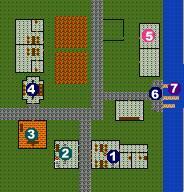 Upon first entering Fenris Port check out the building in the southeast corner of town. This is the inn, and the innkeeper, Johanna, will sell you some advice if you first buy a round of drinks from her. The building just to the west of the inn is a Common Weaponsmith, and west of that is Kurtz's Shop. Kurtz will sell you some alchemical recipes and identify your items for a small fee. He'll also tell you where you can get some fresh alchemical ingredients for only 100 coins. Just to the north of Kurtz is the Anama temple. It's run by Father Gavlax. Go through the regular routine of asking about his beliefs and agreeing with him. Other than that he's pretty much just a grumpy old man. There are two barracks north of the temple, and to the east of the northern one is a pen with some wolves in it. The two buildings along the water on the eastern side of town are storage rooms. The northern of the two contains some roaches. Standing near the docks is Volb, who will sell you tickets to Softport, though he himself doesn't know that that's the name of the town. That's it for Fenris Port, so now we'll go check out the Northpoint Lighthouse. If you have the ingredients make a curing potion before leaving Fenris Port and keep it in your inventory until you meet the Anama members that wander the road around the lighthouse. They'll give you a quest to bring them a curing potion.